The Anti-Bullying Bill of Rights, a 2011 law designed to protect students from harassment, intimidation and bullying (HIB), is the strongest anti-bullying law in the country. As the Anti-Bullying Specialist at HMS, it is my responsibility to investigate reported incidents of HIB and oversee bullying prevention efforts, working closely with the administration, staff, students, and parents/guardians. Positive school climate is a priority at HMS; we have a comprehensive and proactive approach to maintaining an atmosphere of respect and kindness, where bullying behavior is simply not acceptable or tolerated. 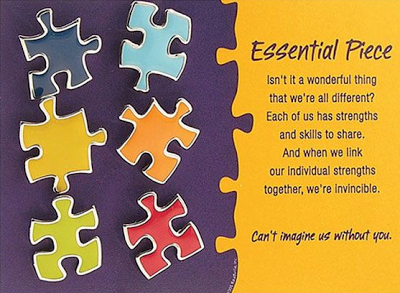 Our theme this year is “HMS – where everyone fits in” and using the metaphor of puzzle pieces, we will emphasize the message that HMS is not simply focused on tolerance of differences but on embracing and celebrating the uniqueness of each member of the HMS community. The pieces of the HMS puzzle are many: students, teachers, secretaries, nurses, custodians, librarian, cafeteria staff, computer resource staff, bus drivers, administrators, instructional assistants, counselors, Child Study Team members, Effective School Solutions clinician, student teachers, coaches, volunteers, and of course parents, guardians, and all family members! Digital Citizenship: We continue to remind students to be caring citizens at all times, especially when using technology. "Chromebook Care" posters displayed throughout the building remind students of appropriate digital etiquette. Our 7th grade assembly program by Richard Guerry of the iRoc Institute highlights that digital “footprints” are forever. HMS staff will continue to conduct lessons on “Digital Citizenship” each marking period. STAR Club (Students Together Achieving Respect): Open to all students, this group meets all year and sponsors year-round activities to promote positive school climate and spread kindness and compassion including Mix it up at Lunch Day, Peace Week, No Name-Calling Week and Appreciation Days for our custodians, cafeteria staff and bus drivers. Positive Behavior Intervention Program: An educational program for students who violate the HIB policy or other Code of Conduct expectations. Students meet with a counselor during study periods to address their behavior, with a special emphasis on empathy development and restorative actions. Support groups: Facilitated by Student Assistance Counselor, Guidance Counselors, School Social Worker and School Psychologist, these groups focus on assertiveness skills, coping skills and building self-esteem. HIB Prevention begins at home! As parents/guardians, you are vital to the effectiveness of HIB prevention. Today’s students are “digital natives” – they have grown up immersed in technology. Parents/guardians are often “digital immigrants,” struggling to keep up with the ever changing world of technology, particularly social media. There are many good resources available to assist parents/guardians with navigating the digital world, including www.commonsensemedia.org. Students NOT keep their computer in their bedroom, and for parents/guardians to be vigilant in monitoring internet activity. Students NOT be permitted to have cell phones in their bedrooms overnight. Especially with regard to cell phones, remember it is YOUR device and phone plan, and children do not automatically have privacy rights with regard to their use of the devices. You should know the password to your child’s Genesis account as that is the ONLY way that you can have access to all their information. As part of the HMS puzzle, collaborating with us with these actions at home, along with our school prevention programs, will help to ensure the safety and well-being of all students. Questions? Contact me at 908-431-6600 ext. 2296 or email at amahler@htps.us.